Chinatown in Los Angeles is located in the city center, next to the Mexican Olvera Street. The Chinese quarter of Los Angeles was formed in the 80s of the 19th century. By 1910, it had grown to 15 streets with two hundred buildings; people from China lived there. Now people from other Asian republics live in Chinatown: Thais, Vietnamese, Indonesians. According to various estimates, about 30 thousand people of Asian descent live in Chinatown. There are many shops and cafes of national cuisine. A Chinese theater, 3 temples, and its own newspaper were opened. 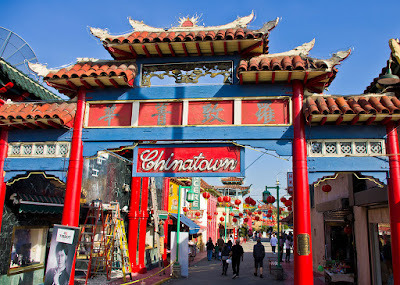 Since the 1910s, the decline of the original Chinatown in Los Angeles began. Since the 1930s, the development of a new Chinatown began, positioned as a place of attraction for tourism in the city. A significant event was the construction of the Central Plaza – a kind of Hollywood version of Shanghai, in the creation of which employees of Hollywood studios took an active part. Chinatown is located north of downtown between the Dodger Stadium and Los Angeles Civic Center. The main streets of modern Chinatown: Broadway, Spring Street, Hill Street. On Broadway there are many Chinese shops, shops, bazaars, and restaurants, there are always a lot of tourists. Unlike the streets of Chinatown in New York which are very crowded, the street of Chinatown in Los Angeles is quiet and calm. In Los Angeles’s Chinatown, street trading is flourishing, just like in China. There, you will find many shops selling fresh fish, crabs, turtles, etc. In front of the entrance to many buildings, there are sculptures of two lions, traditional for Chinese culture. Since there are no lions in China before the Chinese did not know the difference between a lion and a lioness, so the lion has a core under its paw, and a lioness has a little lion cub. Los Angeles Chinatown is the place where not only the Chinese diaspora is concentrated, but also many other Asian and Asian groups: Thais, Vietnamese, Indonesians, and others. All of these immigrant groups are represented in the area by a huge number of national institutions. According to various estimates, about 30 thousand people of Asian descent live in Chinatown. Chinatown – one of the main attractions of Los Angeles, is an atmospheric and unusual place where you can try exotic national dishes, go shopping and have fun. Los Angeles Chinatown is an interesting and atmospheric place, although such a large number of curved roofs in modern China can be found only in the former palaces of emperors. In Chinatown, it is interesting to just wander the streets, go to the shops, pharmacies where you can buy a dried snake or a toad as a medicine, try Chinese food, and after a long day filled with impressions you can finish the trip with Chinese massage. If you like us here, you’ll love our Tweet!